I was inspired to write this book to detail the difficulties that I experienced, beginning in my early childhood years, and to explain how determination within myself helped me make positive life changes. Starting from a very young age, Sylvia’s journey of health-related obstacles began to arise. In her new novel, she chronicles her challenging dilemmas and gives readers insight on how she overcame such hardships, so they too can learn to take their lives into their own hands. Sylvia helps others understand that listening to one’s inner guidance can be life changing. In the book, Sylvia goes in depth about finding and expressing her spiritual calling through various pathways and specifies how she changed her life around, for the better. 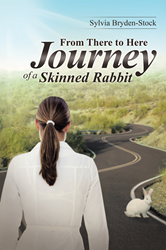 “From There to Here: Journey of a Skinned Rabbit” homes in on the process of overcoming hardship, the key to personal development and reminds readers to never give up, no matter how hard life gets. Sylvia Bryden-Stock is a transformational coach and takes pride in helping others heal through difficult life challenges. She spent many years as a nurse and is part of several professional organizations, such as Association of Coaching, Guild of Spiritual Workers, and Professional Speakers Academy. Sylvia has written five other novels and currently resides in Woking, England. To learn more, please visit http://www.brydenstock.com/.